Twelve years after the last time it went through the Laguna, the Corsa Rosa will start on the 9th of May from the Lido in a priceless setting. Mayor Cacciari made the announcement in Milan. MILAN, 30 October 2008 - Venice, 9 May 2009. The 100th Giro d'Italia will start here. Twelve years after the Corsa Rosa last went through the Laguna. A priceless start for a unique, different and highly anticipated edition of the race. The official announcement came from the mayor of Venice, Massimo Cacciari, during an evening in a well-known locale in Milan where Rcs Sport launched the display promoted by La Gazzetta dello Sport. "Venice is delighted to host, after a twelve year interval, the first stage of the Giro d'Italia, and especially on the very special occasion of its Centenary" - said Cacciari. "In sporting contests, as in the welcome extended to tourists, in its great exhibitions and numerous conventions, Venice honours its role as an open and privileged meeting place, and as a place for dialogue among different peoples and cultures." Friday, October 31st- A ferocious snow storm hit us on Tuesday. It's extremely rare to have snowfall at this early date, and a storm of this intensity in October is unheard of. In fact, I was planning the route for this upcoming Saturday's ride when it started to snow. At first I thought, "OK, no riding today....". In a few hours the situation turned for the worse. With trees still full of leaves the snow weight caused trees to crack and fall. The woods were filled with the sounds of gunshots which were actually the sounds of trees cracking. Next came the inevitable: loss of electricity. We had no power for 3 days. Meanwhile only 10 miles away my friends didn't even know it had snowed! Fortunately, today is warm and the snow is melting and the ride tomorrow is a go. We'll see what brave souls show up. October 23rd and October 24th: The Fall (Autumn) foliage has peaked in western New Jersey. Now rides will be on the chilly side which can still be enjoyable when there is full sunshine. 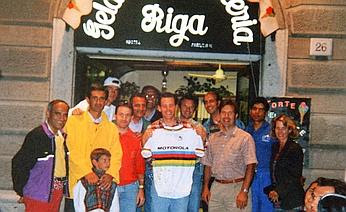 Celebrations at Rigamonti ice cream parlour in Como after Armstrong's victory in the 1993 world championships. Lance lived in an apartment in Como from 1992 and 1995. His former roommates tell about the Texan, his training, love of ice cream and capuccino. The women's bicycle given to him after winning the world championships is still in his former building. COMO, 16 October 2008 - Lance Armstrong used to live on the fourth floor of a six-storey building located at Magenta 25. First, he shared his apartment with Frankie Andreu and then he lived by himself. The apartment, located right off the elevator on the left, was about one hundred square metres and is now occupied by Andrea Rumi, a 19-year-old accounting student. "Unfortunately, I'm neither a cyclist nor a cycling fan. I own a city bike, but it's old and pretty plain. The only thing left here from Armstrong's time in the apartment is a fitted cupboard." A TRIATHLETE - His neighbours remember it well; not the fitted cupboard, but rather Armstrong even if at that time (1992-1995, first in Como and then in a hotel in Bellagio), the future seven-time Tour winner looked like a triathlete which explains the dimensions of the closet. "I used to live on the third floor, right below him," recalls Armando Sommariva, pensioner. Armstrong used to do the cleaning, sweep all the dust and garbage and then he would throw it down... On my place, right onto my balcony." However, Sommariva didn't get mad: "He was polite and reserved. Other than his mother, I have never seen him bring a woman home." 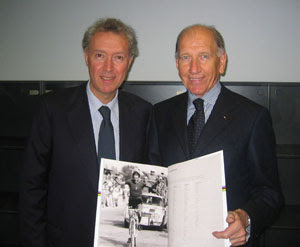 A BIANCHI BIKE - Piero Ortelli, Armstrong's former fifth floor neighbour, added: "He was an exquisit person. He would go in and out, never bothering anyone and his Italian was okay. Some days I would come across him in the morning, on the bike, sweating, in the basement. Other times I would see him sunbathing on his balcony. When he came back home after winning the 1993 world championships in Oslo, we gave him a gift: we got him an old women's bike, all rusted and ramshackled. My daughter Daniela, who is an English teacher, had written a note: "You would have even won on this one!" The bicycle, a Bianchi Sport, is still around: the brakes are detached, the light cables are frayed, the wheels are on the ground and it's covered in cobwebs. "Armstrong left it here," said Ortelli. "Maybe one day he'll come back for it." CAPPUCCINO - On training days, Armstrong used to go by Piazza Volta, where the day's programme would include a cappuccino at Bar Volta and the training schedule would be thrown at him by his coach Massimo Testa from a second floor balcony. 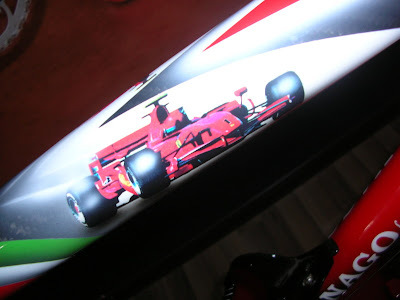 "Then would come a lap around the lake; 180 Km of hard work," recalls Andrea Peron, Armstrong's training mate in 1993 and 1994 and his team-mate at Motorola in 1995 and 1996. 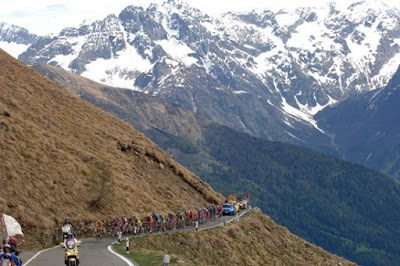 Sometimes, practice would be at Ghisallo, Tivano or Lissolo; less in Varesotto because that was too hard. However, whenever he set a goal for himself, he gave his best: before the 1994 Liegi, where he finished second, we left at 9 in the morning, made 220 Km and finished at 3 in the afternoon in a bar watching the Roubaix race on TV." SUITE AND SWEETS - Armstrong's Como is now Terminus Hotel: "Whenever he comes here," explained hotel manager Cristina Zucchi, "we immediately make our junior suite available to him; room 300, with a 40-square metre balcony overlooking the lake." The hotel restaurant, Bar delle Terme, "offers the following delicious specialties," highlights director Maurizio Gerosa, "steak tartare, Milanese cutlet and curry chicken with rice pilaf." He used to frequent Riga ice cream parlour, now turned into a bakery-pastry shop-ice cream shop named Golosità. "He used to wear a red plaid shirt, loved pistaccio and used to order my specialty pastry," tells Roberto Rigamonti. It's called "fishermen's bread" (pan del pescatore) but I've renamed it "ruler"; it's a combination of short pastry with candied fruit, raisins and walnuts." Rigamonti displays on the wall the yellow jersey worn by Armstrong in the 2005 Tour. He has plans for the 2009 Giro de Italia: "I will make Lance a special ice cream, zabaglione flavour but very high in fat and with lots of eggs. That would be the only way the Italians could win." 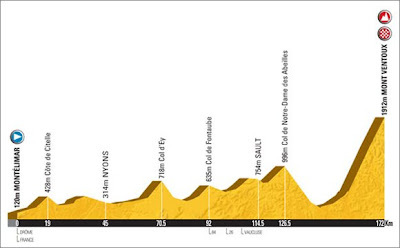 In a twist, the Tour de France organizers have decided to make the previous stage to Paris a showdown on Mont Ventoux. In the recent past there has been a time trial which meant the climbers would have to make time on the time trialists in the preceeding stages. Now the shoe will be on the on the foot, with the time trialists having to make time on the climbers before reaching Mont Ventoux. Click on the 2nd, 3rd and 4th photos above to get a sense of the scale of Mont Ventoux....the small objects are cyclists coming up! Our trip in June, 2006, with Eros Poli's group to Mont Ventoux was blessed with fantastic weather. At the top of Mont Ventoux is a large antenna/telecommunications facility. Which is a reminder: the weather on mountain tops and passes can be very unpredictable even in summer. 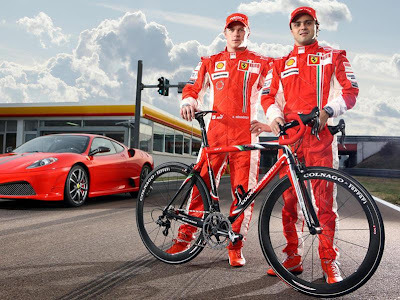 Italian racing icons Colnago and Ferrari have teamed up yet again for another limited-edition road bike, the CF7. Just like the gasoline-fueled racers that bear the signature prancing horse, though, you had better make sure your finances are in order before putting ink to paper for one. According to James Winchester of US importer Veltec Sports, the CF7 is essentially a specially finished and outfitted version of Colnago's existing EPS frame with the same high modulus and ultra-high modulus carbon fiber content, subtle tube shaping, and tube-and-lug construction. The lobed down tube is a constant 44mm in diameter and further reinforced with Colnago's 3PRS system whereby additional strips of carbon fiber are applied to the tube's interior for extra rigidity. The conical top tube boasts a 40mm dimension up front and tapers to 35mm at the seat tube, and the newly tapered all-carbon fork now uses a 1 1/4" diameter steerer at the crown for increased steering and braking precision. 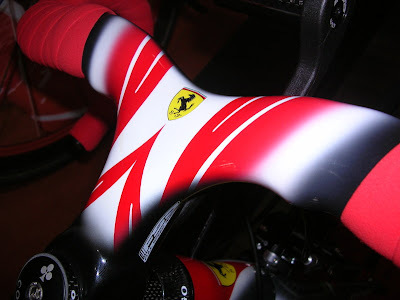 Colnago and Ferrari will offer just 99 copies of the CF7 to the tune of US$17,500 a piece. In addition to the custom finish, each will also be equipped with a top-end build kit that includes a complete Campagnolo Super Record group, Fulcrum Racing Speed deep-section carbon tubular wheels, and an integrated carbon fiber bar and stem. Prospective buyers are naturally advised to act quickly; numbers 1, 2, 3 and 88 are apparently already spoken for and Veltec will only bring 25 copies to the US. I still haven't found my winter cycling gloves since the move from Italy so I had to go buy a pair. After looking at several I settled on a pair of Pearl Izumi GAVIA cold weather gloves. The only thing Italian about these gloves is the name GAVIA, they are made in China. 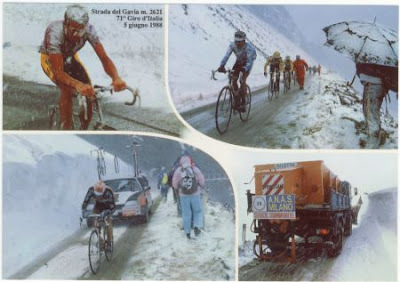 Nevertheless, the Gavia Pass in Italy has its place in Giro d'Italia history, especially 1988. 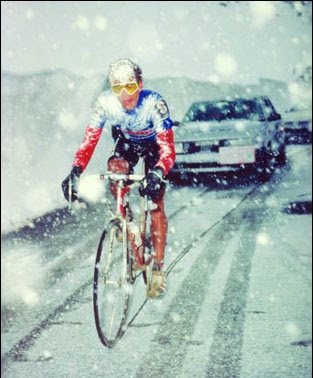 Andy Hampsten went on to win the Giro that year and said of the conditions that day on the Gavia, "As I climbed higher and higher, my mind started wandering and the psychological aspects of what was happening started to creep into my mind. I felt that I had achieved my results, to date, without taking any shortcuts, but when it started getting bad, I thought about what I could do to make things better. I gave up on asking God for any help, I was blessed already having the privilege of racing, instead I speculated on what I would bargain for if the devil showed up...."
Back to the gloves: They use AmFIB material (whatever that means) for water and wind protection. Pearl Izumi uses a scale of 1 (low) to 10 (high) to indicate the degree of water protection and these are rated a 9 on that scale. Oddly, they don't refer to any degree of cold protection. Things I liked about the cloves: great fit, a fleece section on the top that you can use to wipe your forehead/nose,etc., little knobbies to improve grip, and a zipper to keep the gloves snug. I used them Sunday the Covered Bridges Ride and they kept me toasty all day. Monday, October 20th: I took care off all the things I had to do early enough to get a recovery ride in from yesterday's 63 miles of climbing. It's was just toooooo beautiful to not go. I did easy spinning as much as I could but it's always inevitable to have to climb in order to get home. Sunday, October 19th: Fifteen Bedminster Flyers participated in the Central Bucks Bicycle Club's 28th Annual "Covered Bridges Ride". We tackled the challenging, hilly, 50 and 63 miles routes through central and upper Bucks County, Pennsylvania, passing through historic covered bridges. After an unusually warm early October the temperatures dipped to freezing overnight and sunrise revealed frost in the fields. 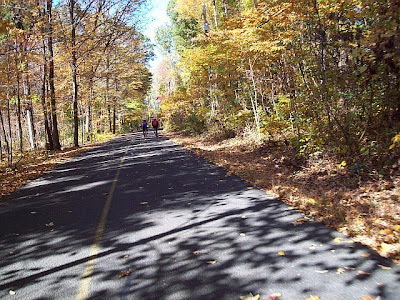 It was going to be a perfect Fall day for cycling, sunny with a chill in the air. Six of us started the 63 mile route at 9:00 a.m. We rode at a sensible, steady, pace and enjoyed the beauties of the day. It was a great ride. -Assume there is gravel at every turn! -The covered bridges on this ride have wooden plank road surfaces that are uneven and may present a hazard for cyclists. At each bridge please take extra caution, and for ensured safety, dismount and walk your bike through the covered bridges. Photos: Covered Bridges artwork; event check-in; the 63 mile hilly riders: Teddy (12!, he forgot his cycling shorts so rode in his jeans), me, Kathy, Carlos, Josh (13!, Teddy's brother, he wore his pyjama bottoms to stay warm), Eddie. Note: Teddy and Josh are AWESOME cyclists; at the first covered bridge; the wood construction of a bridge, notice road surface of wooden planks; various ride photos; river scene as we neared the finish; the finish picnic area. Thanks to Lee and Kathy for supplying additional photos. 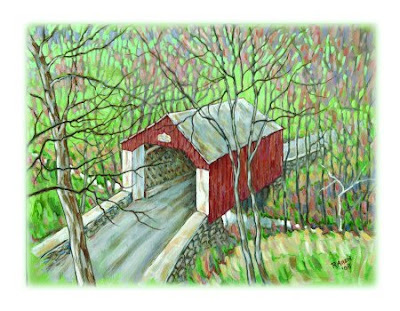 The covered bridge is an important and significant historic structure in the Commonwealth of Pennsylvania. Not only does Pennsylvania have the most extant covered bridges today, it probably had the most during the height of, the covered bridge period 1830 to 1875. Estimates have been made that Pennsylvania once had at least 1500 covered bridges, historically known as "kissing" or "wishing" bridges because young couples used the shaded passages to steal a kiss while others would make a wish before entering a new bridge for the first time. Not only is the sheer number important, but Pennsylvania had the first known U.S. covered bridge, as well as the prototypes for most of the major truss types. From the completion of this first bridge, the age of the covered bridge was upon Pennsylvania. 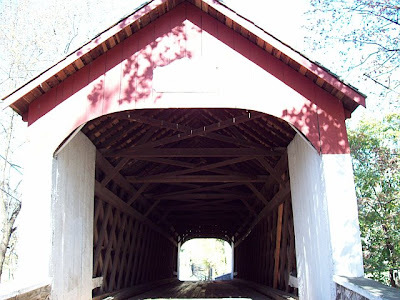 Not only were the truss types of Burr and others first tried out in Pennsylvania, but the covered bridge spread as the local carpenter adapted it to the local problem of crossing the numerous small streams and creeks throughout Pennsylvania. The covered bridge is also important in the history of bridge building. The early stone arch bridges were really only practical on smaller streams and then in areas with an abundance of good building stone. The peak of the stone bridge is Pennsylvania can be seen in the Rockville Bridge over the Susquehanna River built by the Pennsylvania Railroad and contains a quarter of a million tons of stone. The covered bridge was the transition from the stone to the cast-iron in most places. In the Lehigh River area the covered bridge was more abundant. Carbon County has only two remaining bridges, one of which was saved only by its removal by the Beetzville Dam project area. Lehigh has retained six of its original wooden spans but Northampton only one. Bucks County today retains 13 of its original 36 covered bridges, most of them in Upper Bucks. The strict usage of the Town truss within the county is unusual and represents the largest number of Town truss bridges anywhere in the State. Sources of information: Covered Bridges of the Delaware River Watershed -- a National Register of Historic Places thematic resource nomination. Bucks County at one time had 36 covered bridges, 13 of which still stood at the time of the first Covered Bridge Ride in 1981. Most have been well-maintained by the County and several have been restored (proceeds form the ride have gone towards maintenance of the bridges). The following are the 13 covered bridges of the original CBBC Covered Bridge Century. Cabin Run Covered Bridge * ^Location: Covered Bridge Rd., Plumstead Twp.Height Limit: 11 ft. 10 in. Width: 15 ft.Length: 82 ft. Weight Limit: 3 tonsBUILT in 1871, this bridge crosses the Cabin Run Creek, so named for the small houses that dotted its banks in the 19th century. It is located a short distance downstream from the Loux Covered Bridge and just down the road from historic Stover-Myers Mill. Frankenfield Covered Bridge * ^Location: Hollow Horn and Cafferty Rd., Tinicum Twp.Height Limit: 11 ft. 3 in. Width: 12 ft.Length: 130 ft. Weight Limit: NoneBUILT in 1872, the Frankenfield Covered Bridge crosses Tinicum Creek in an area once known for its abundant turtle population and only two miles upstream from where the creek flows into the Delaware River. This bridge is one of the longest covered bridges in the County. Erwinna Covered Bridge ^Location: Geigel Hill Rd., Tinicum Twp.Height Limit: 11 ft. Width: 15 ftLength: 56 ft. Weight Limit: 29 tonsALTHOUGH the National Historic Register lists the date built as 1871, county records suggest this bridge was built in 1832. The Erwinna Covered Bridge, which crosses Lodi Creek, is a good example of the lattice-type construction and is Bucks County's shortest covered bridge. Knecht's Covered Bridge * ^Location: Knecht's Rd., Springfield Twp.Height Limit: 11 ft. 6 in. Width: 15 ft.Length: 110 in. Weight Limit: 3 tonsBUILT in 1873, this bridge is also known as "Slifer's Bridge". Built of hemlock, it crosses Durham Creek, which was once known as "Cook's Creek". The Loux Covered Bridge * ^Location: Wismer Rd., Plumstead Twp.Height Limit: 11 ft. Width: 15 ft.Length: 60 ft. Weight Limit: 15 tonsBUILT of hemlock in 1874, you'll find this bridge is one of two bridges to span the Cabin Run Creek. Nestled in a scenic valley, it was built at the insistence of local residents who complained about the dangers of crossing the creek. Mood's Covered Bridge * ^Location: Blooming Glen Rd., E. Rockhill Twp.Height Limit: 11 ft. 2 in. Width: 15 ft.Length: 120 ft. Weight Limit: NoneBUILT in 1874 and spanning the Perkiomen Creek just outside Perkasie, Mood's Covered Bridge is one of the most used bridges in Bucks County. Its timbers were damaged by a truck in 1993 and it was subsequently restored, but was struck again by another truck in January 2004 and then was almost completely destroyed by arson in June of 2004. Due to repairs, the bridge is closed until further notice and its future is in doubt. Pine Valley Covered BridgeLocation: Old Iron Hill Rd., New Britain Twp.Height Limit: 11 ft 10 in. Width: 15 ft.Length: 81 ft. Weight Limit: NoneBUILT in 1842 of native hemlock and pine, the bridge is also known as "Iron Hill Bridge". The bridge crosses Pine Run Creek, which was named after the hardy neighboring pine trees. Schofield Ford Covered BridgeLocation: Tyler State Park, off Swamp Rd., Newtown Twp.Height Limit: 13 ft. Width: 16 ft.Length: 170 ft. Weight Limit: No Vehicle AccessORIGINALLY built in 1873, it burned down in 1991, and was rebuilt in 1997. Built of native hemlock and oak, this town truss bridge is the longest in Bucks County. Also known as "Twining Ford Bridge", it crosses Neshaminy Creek. Sheard's Mill Covered Bridge * ^Location: Covered Bridge Rd., on the border of Haycock and E. Rockhill Twps.Height Limit: 12 ft. 1 in. Width: 15 ft.Length: 130 in. Weight Limit: NoneBUILT in 1873, this bridge spans Tohickon Creek and is one of several bridges built to aid farmers transporting grain to local mills. South Perkasie Covered Bridge *Location: Lenape Park, Walnut St., PerkasieHeight Limit: No Vehicle Access. Width: 15 ft.Length: 93 ft. Weight Limit: No Vehicle AccessBUILT in 1832 of pine and oak, this bridge once crossed Pleasant Spring Creek until it was condemned to traffic and is now owned by the Perkasie Historical Society. It was moved to Lenape Park near the East Branch of the Perkiomen Creek in 1958. Uhlerstown Covered Bridge ^Location: Uhlerstown Rd., Tinicum Twp.Height Limit: 11 ft. 3 in. Width: 15 ft.Length: 101 in. Weight Limit: NoneBUILT in 1832, this bridge is built of oak and has windows on both sides. It is the only covered bridge that crosses the Delaware Canal. Van Sant Covered BridgeLocation: Covered Bridge Rd., Solebury Twp.Height Limit: 12 ft. 6 in. Width: 15 ft.Length: 86 ft. Weight Limit: 7 tonsBUILT in 1875, and also known as "Beaver Dam Bridge", this bridge crosses Pidcock Creek. You'll find this bridge is close to Bowman's Hill and the Thompson-Neeley House, part of Washington Crossing Historic Park. Haupt's Mill Covered BridgeLocation: Kellerman Rd., Springfield Twp.Height Limit: ? ft. ? in. Width: ? ft.Length: 107 ft. Weight Limit: ?BUILT in 1872, this bridge over Cook's Creek was destroyed by fire in 1985 and was not rebuilt. The Covered Bridge ride now also visits the only remaining covered bridge in New Jersey:Green Sergeant's Covered Bridge ^Location: Rosemont-Ringoes Rd., Delaware Twp., Hunterdon County, NJHeight Limit: ? ft. ? in. Width: ? ft.Length: 84 ft. Weight Limit: ?BUILT in 1866, the Green Sergeant Covered Bridge, a classic whitewashed structure spanning the rocky Wickecheoke Creek, is the only remaining covered bridge in New Jersey. I was just riding around, taking it easy, soaking in the Fall colors when two teenage riders snuck up on me on their tandem. An old, beat-up tandem. As they passed me they were pedalling their 50 pound beast furiously. I decided not to chase them until they were way out of sight. With each succeeding roller I would gain ground; they virtually ground to a stop on every uphill and I wasn't loosing too much time on the downhills. 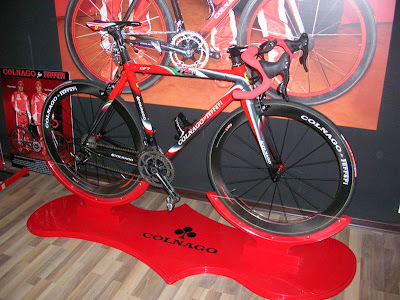 When I passed them one of them said, "It's no use, he's riding Campagnolo!" 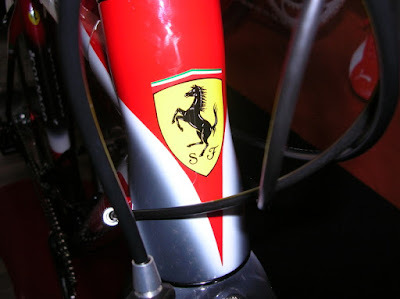 Such is the mystique of Campagnolo. 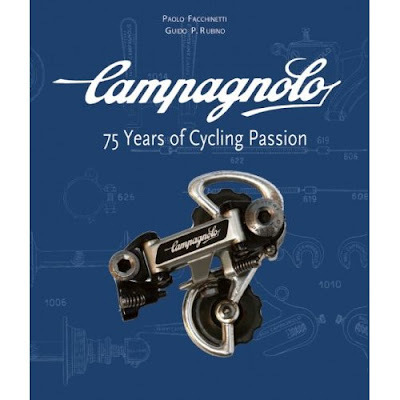 Which brings me to the just received book, the anniversary "Campagnolo, 75 Years of Cycling Passion". I'm enjoying reading it, and recommend it. Early on it discusses how Tullio Campagnolo came to invent the wheel quick release lever system. In the 1920s "there remained the fact that to change gears the rider had to get off the bike, release the rear wheel by twisting the wingnuts of the hub, spin the wheel around, then remount it, fitting the chain to the sprocket and then redoing the wingnuts...."
Campagnolo,"a promising cyclist", found himself in a race in 1927 on the Croce d'Aune in the snow. "I was paralyzed by the cold. Working on the nuts, my hands began to bleed because the wheel would not come off. When I got home, defeated and discouraged, I began to think about what was to become the most perfect derailleur in the world." "His quick release hub was the first milestone in an authentic technological revolution." Wednesday, October 15th: My Italian friends would always ask, "Which is better, Italy or the USA?". My answer was always the same, "They are different, one is not better than the other". For all the wonderful sights I saw in Italy in 3 years, the Fall (Autumn) season in the northeast of the U.S. is a sight of unique beauty. A few of us on the Wednesday night ride wanted to go easy and appreciate the day (rather than having our eyes glued to the wheel in front). With that Eddie, Kathy, and I set out. Still riding in short sleeves no less.